Chronic ear infections are common problems many dogs face, but they are easy to prevent if you know what to do. Many ear infections occur but are never resolved in pets—it could be the lack of emphasis placed on ear maintenance for canines that makes it an issue. There are two basic causes of ear problems in dogs, and they are chronic inflammation and infection. When inflammation is left untreated, it can lead to an infection. If a dog’s ears are warm to the touch, red, swollen, or itchy but with little to no discharge, the problem may be inflammation. However, if one or more symptoms are present along with an obvious amount of discharge, then this could be a sign of infection. The most common reason for dog ear inflammation is an allergic response whether it is to food or something environmental. Dogs with allergy related inflammation will likely run their head along furniture or on the carpet to try to relieve the itch. They may also scratch incessantly or shake their head a lot. If you notice your dog doing any of these things, it may be best to have their ears checked for redness and swelling. Another cause of inflammation is moisture or “swimmer’s ear.” This occurs primarily during the summer when dogs are often playing in lakes, ponds, and pools. Wet ear canals combined with a warm body temperature make the perfect environment for inflammation and then ear infections. To prevent this, it is important to thoroughly dry your dog’s ears each time he or she leaves the water. Dogs who live in high humidity are also at risk for regular ear infections and should be watched closely. The third major reason for ear problems is wax buildup. 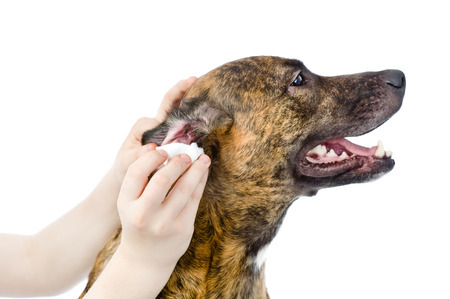 The presence of earwax is normal, but dogs have varying amounts just like humans—in fact, some breeds may have an abundance of wax that may need regular attention. For dogs of these breeds, it may help to get them accustomed to ear cleaning while they’re puppies. Some canines are more prone to ear infections than others, and for that reason, dogs’ ears should be checked every other day at a minimum and cleaned when they are dirty. Simple as that. If you suspect your dog has an ear infection or even just inflammation, make an appointment with your veterinarian immediately and do not merely use the likes of Manuka honey. Before an infection ever takes place, some alternative cleaning agents include: witch hazel, organic apple cider vinegar mixed with water, green tea, or a drop of tea tree oil mixed with 1 tablespoon of coconut oil.